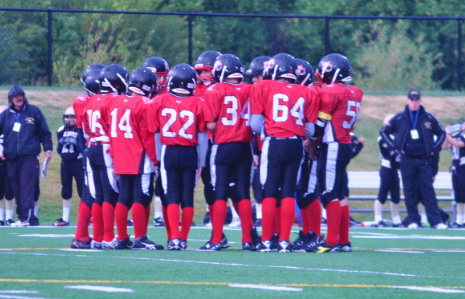 CHESTERMERE – The Chestermere Pee Wee Chiefs headed into week three of the season by facing off against the Calgary Mavericks on Sept. 13. The chiefs drove 60 yards in the first play of the game, culminating in a 30-yard scamper for the first points of the game by Jaxson Karl. However the lead didn’t last long as the Mavs soon answered back with their own touchdown. The Chiefs had some fumble problems, as they gave up a crucial fumble on the opposition’s 50 yard line. The Mavs promptly took advantage, driving to a touchdown. The Chiefs moved the ball well on their snext two possessions, we ended up turning the ball over deep in Maverick territory on two consecutive drives. On the last Maverick drive of the half, the Chiefs defence held strong. Half time began with the Chiefs trailing by a score of 20 – 6. However, the defence came up huge to start the second half, not allowing any points. “They spent most of their time in the Mavericks backfield sacking the QB or generally causing havoc for their offence,” Johnson said. The Chiefs offence in the second half moved the ball very well behind the strong play of the offensive line, but they continued to have some small execution errors which led to them only scoring one major in the second half. Jaxson Karl completed a five- yard run for his second touchdown of the night. The defence couldn’t win the game for the Chiefs, who suffered a 20 – 12 loss in the end. The Chiefs are off until Monday Sept. 26 when we play the Stampeders, before their rematch on Sept. 30 against the Golden Hawks. The Atom Chiefs took on the Calgary Colts on Sept. 18, but coach Clinton Bean said that there wasn’t much to talk about this week. Bean said that the Chiefs weren’t able to get into the end zone due to the high level of ball pursuit showed by the Colts. “When you only have five plays to move the ball 45 yards and the other team can tackle as a group it’s going to be a tough day,” he said. The defence held the Colts to only one touchdown in the first half and it was a close game until a few injuries started to mount and the flood gates opened in the second half. “Despite the loss we learned a lot about our team and what areas we will have to work on to get better,” Bean said.